Opportunities for scholarships, summer internships, or research experiences. ​It's time to start thinking about summer programs for 2019! If you come to the January 22 (2:30 - 3:30 pm) workshop at Metro 500, or the January 24 (2:30 - 3:30 pm) workshop at Southeast 8264, you will learn how to search for and find good programs that fit your interests and that provide you with some great experiences. There will also be Professors present to assist in reviewing an application if you have already started putting your packet together for a specific internship. 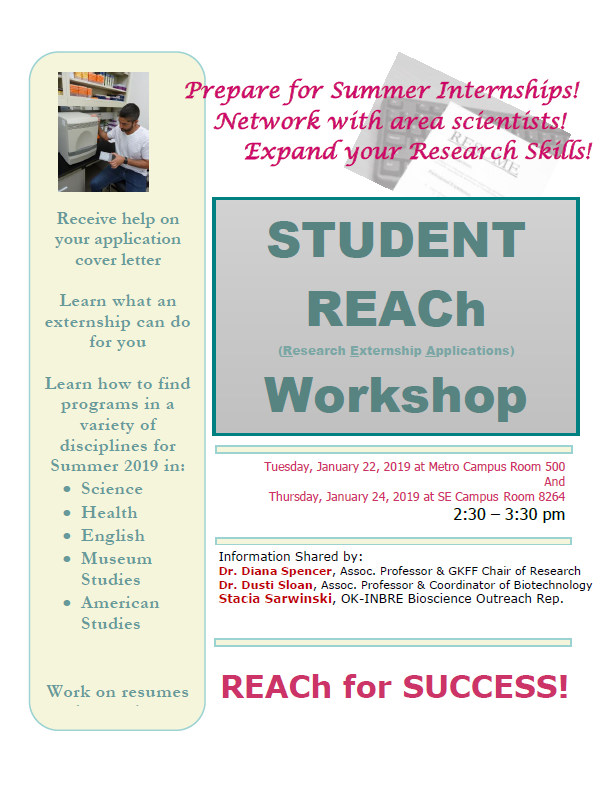 Workshops will be presented at both campuses by Dr. Diana Spencer and Stacia Sarwinski, and Dr. Dusti Sloan will be at the workshop at Southeast. Snacks will be provided. ​Come see why you should participate in a summer program! Click below to see a presentation to the Club of Medical and Natural Sciences about summer programs. 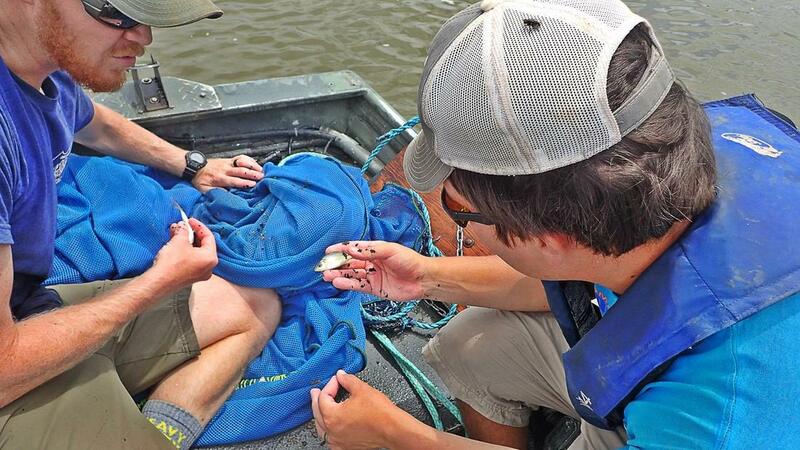 The Stream Program, headquartered out of the East Central Regional Office near Muskogee, will be hiring two interns to assist with fisheries surveys this summer. Interns may choose either 3-month, 40 hours/week or 6-month, 29 hours/week appointments. 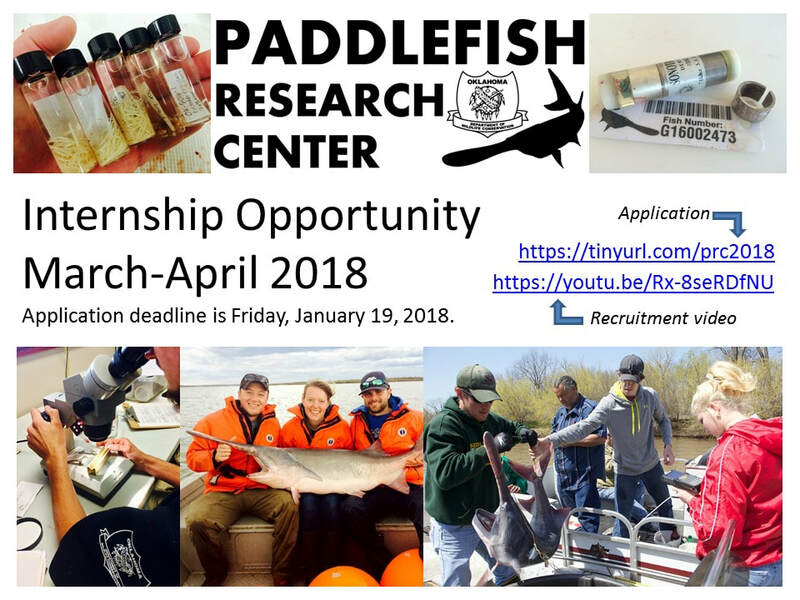 Current college students majoring in wildlife and fisheries related fields may apply online (link provided below). Selected interns will gain valuable experience in stream and river systems across the state utilizing a wide variety of fish sampling methods that target both game and non-game species. Overnight travel will be required. Deadline to apply is March 16th, 2018. While completing the application please specify your desire to work for the Streams Program or East Central Regional Office. This is a nine-week summer program in materials science and engineering at OSU in Stillwater. Engage in cutting-edge research in materials processing, testing and characterization for interdisciplinary applications in energy storage, energy generation, biomaterials, combustion and aerospace. The internship pays $500 per week, plus on-campus housing and transportation. In addition, scholars will be introduced to entrepreneurship and commercialization to transition research from the lab to the real world. Apply by February 16, 2018. Applications are now being accepted for the Mickey Leland Energy Fellowship Program, sponsored by the Department of Energy. There are projects in various sites in TN, MD, NM, CA, TX, OR, and WA. TCC students who plan to transfer to a four-year university in Fall of 2018 are eligible. Submission deadline is January 3, 2018. Get your application in soon! "The mission of the MLEF program is to strengthen a diverse pipeline of future STEM professionals, and this program has mentored several hundred of the best and brightest students from across the nation for future careers in STEM. At the conclusion of the program, Fellows attend a “Technical Forum” where they present their research findings and tour a nearby technical site." It's time to start thinking about summer programs for 2018! If you come to the October 11 (1:00 - 2:00 pm) workshop at Southeast 8296, or the October 16 (2:00 - 3:00 pm) workshop at Metro 626, you will learn how to search for and find good programs that fit your interests and that provide you with some great experiences. You'll also meet former interns to learn how valuable their experiences were and get some great advice on how to structure your application and resume. Workshops will be presented at both campuses by Dr. Diana Spencer and Janice Airhart. Snacks will be provided. OK-INBRE is a grant awarded by the National Institutes of Health Institutional Development Award (IDeA) Program. Primary missions are biomedical research, education and patient care. Tulsa Community College is proud to be one of only 38 community colleges selected for participation in this program. Tulsa area alliance that promotes bioscience education, research and collaboration. They have provided about 30 summer internships since 2011. The following NSF/REU host institutions encourage community college applicants. As always, the sooner you apply, the better your chances of success. Deadlines are listed for the 2017 programs. You should assume deadlines will be similar in 2018. This document lists nearly 50 scholarship, internship, or research opportunities for students. Many of those listed are tailored to attract minority and underrepresented students. Details about application process and deadlines are provided where possible, as well as contact information. Web links are provided with each entry to allow for access to more in-depth information. Click here to access the index in pdf format.